As a computer geek I need a computer that’s online 24/7. This uses a lot of electricity which A. costs money B. Makes the environmentalists in my life hate me. Processor: Celeron 430L 1.8GHz – Maximum power usage of 35 watts. A standard CPU draws 90 watts, enthusiast CPUs 125 watts or more. Motherboard:MSI P6NGM-FD – On-motherboard graphics save energy vs. a discrete graphics card, and I’ll barely ever even connect a monitor. Memory: 1 Gig G.Skill DDR2 800 – not much to say here, it’s the right speed, it’s cheap. 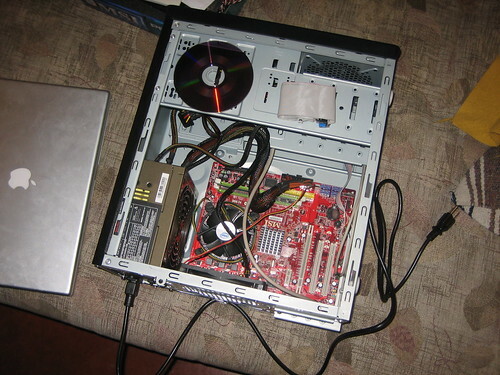 Case: Rosewill R102-P-BK – MicroATX case, cheap, enough room for my hard drives. Operating system: Ubuntu Linux – It’s free, and on this budget I need that. But then problems arise. Ubuntu is on a DVD. The only DVD drive I own is already installed in my current PC and I can’t remember how to get it out. The solution? Siamese computers! 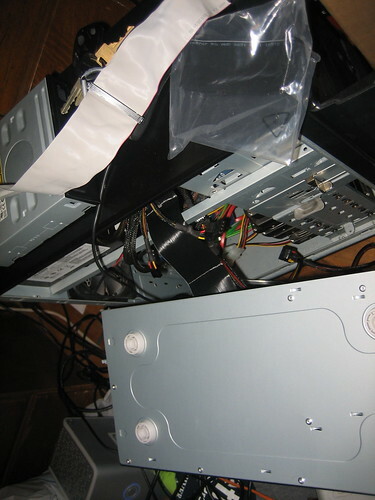 By flipping the new computer upside down and running IDE and power cables between the two I can manage the linux installation! And now, a mere 72 hours later, I have a working computer! Ubuntu has many positive qualities. User customization (without spending hours on google and the absolute beginners ubuntu forums) is not one of them. Anyway the end result: The computer I used to run 24/7 drew 110-120 watts idle. The new one just under 50. For $150 I’ve reduced power consumption by 43-50 kilowatt hours a month. At an electricity rate of 12 cents a kW/h, bringing this new computer online will save 70 bucks a year in electricity and pay for itself in 25 months.